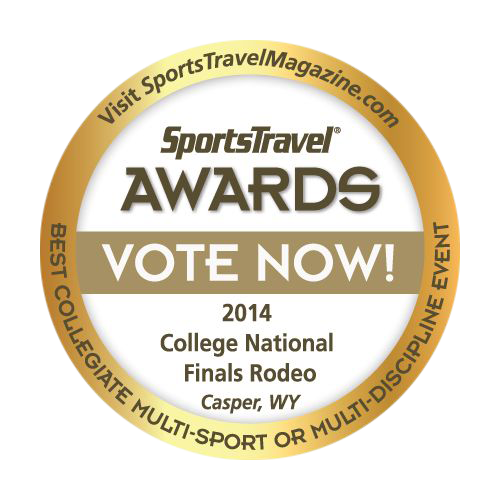 Casper, WY –The College National Finals Rodeo (CNFR) is the “Best of the Best” of college rodeo. It is where the National Intercollegiate Rodeo Association (NIRA) crowns individual event champions in saddle bronc riding, bare back riding, bull riding, tie-down roping, steer wrestling, team roping, barrel racing, breakaway roping, and goat tying. National team championships are also awarded to both men’s and women’s teams. For the 20th year, the nation’s best college cowboys and cowgirls from eleven different regions will enter into the CNFR arena in Casper, Wyoming this June. Over 400 cowboys and cowgirls from over 100 universities and colleges compete in Casper each year. Contestants compete all year in one of the NIRA’s 11 regions for a chance to rope or ride at the CNFR. The top three students in each event, and top two men’s and women’s teams from the NIRA’s 11 regions will qualify for the CNFR. Season Tickets are on sale now. Individual Event Tickets go on sale on Friday, April 13 at 11:30 am. Tickets for Slack Rounds are $8 General Admission. Bulls & Broncs and all Evening performances are $10 General Admission, $20 Reserved Seating (Rows 14-21), and $25 Box Seats (Rows 4-13). Tickets for Saturday’s Championship Round are all reserved seating with Upper Reserved tickets for $15, Lower Reserved for $25, and Box Seats for $30. Season Tickets are $60 General Admission, $110 Reserved Seats, $130 Box Seats. Tickets available online at SinclairTix.com, in person at the SinclairTix Box Office at the Casper Events Center or any statewide SinclairTix Outlet or by phone at 800-442-2256.